Build Server Information radiators are an excellent, easy-to-implement way of getting people to pay attention to broken builds. But it pays to tailor them to your exact needs. This article is a short case study of how easy it is to set up an effective information radiator if you put your mind to it. One of my clients is UBS Investment Bank in London. At UBS, they are into Agile in a big way. Rob Purcell and Gordon Weir of UBS asked me in to help out with some of their Maven, Test-Driven Development, Java coding and tooling practices. And one relatively minor item they were particularly keen on was to improve their information radiator, in order to raise awareness of broken builds. 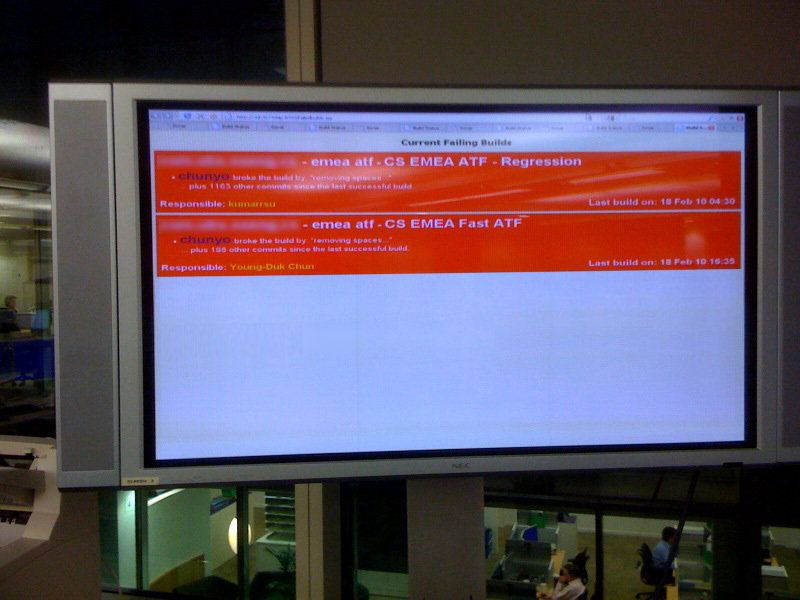 Although they had a large LCD screen displaying the TeamCity dashboard, the information displayed was too small to be very effective at any distance. So we decided to add a new one. Now Rob's team uses TeamCity in a big way. It turns out there are quite a few cool Information Radiator plugins available for TeamCity, such as Team Piazza and Build Wall. However most of the ones I found all took the approach of green boxes for the good builds, and red for the bad. And that limits the number of builds you can effectively place on an information radiator. And UBS have many, many build jobs. They wanted something simpler: just display the failures (after all, you don't really care about the builds that work). 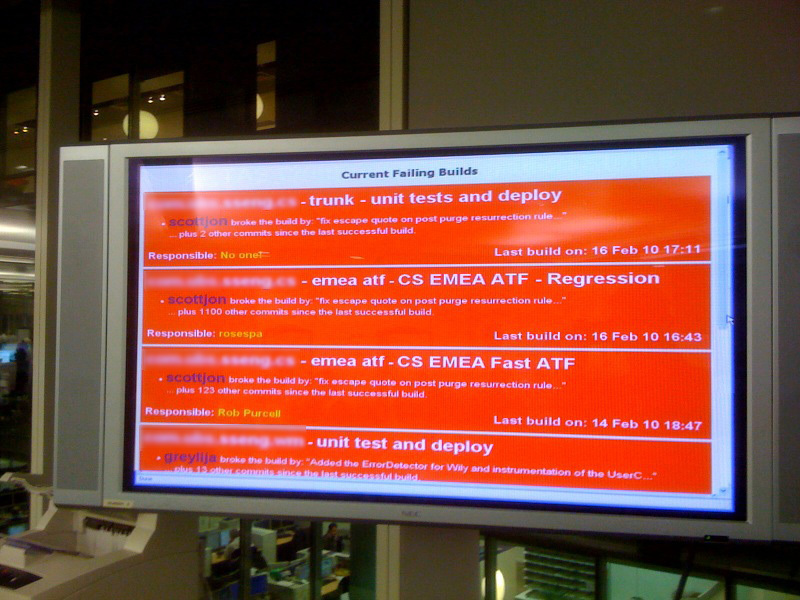 The information radiator also had to cope with displaying failed builds from several different TeamCity instances within the organisation. It turns out that it's quite easy to write your own information radiator in TeamCity, without having to write your own TeamCity plugin. I based the solution on Rob Bowley's customization of the External Status Widget, which came closest to doing what I wanted. The procedure is quite simple. There is a JSP file in your TeamCity installation called externalStatus.jsp, also known as the External Status Widget, which you will find in the TeamCity/webapps/ROOT/status directory. This particular JSP was visibly born to be hacked. In it's original form, it displays a very basic screen showing the current list of build jobs. However, it is fairly easy to modify to display just the failing builds, and with some additional information to boot. 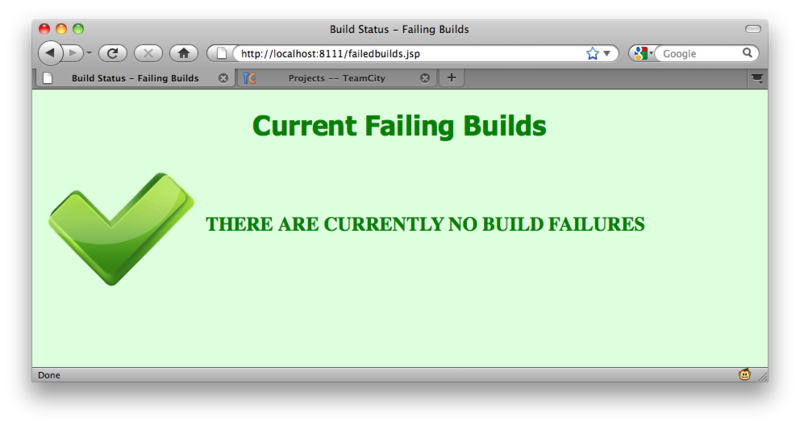 You can view the results on an address like http://my.teamcity.server/failedbuilds.jsp.